If you have been waiting for the Assam HS Result 2019, then you have reached the right place. Looking at the latest happenings at the AHSEC Office in Bamunimaidam in the state capital Guwahati; it seems that the board is planning to declare the Assam 12th Result 2019 soon. Although the final date of the AHSEC Result is not available, in all probability, the council will follow their academic council and declare the results in the third week of May. Immediately following the formal declaration from the AHSEC office, the Assam HS Result will be made available online to the students on this page. Since the completion of the board exams, the Assam Higher Secondary Education Council (AHSEC) has been busy completing the evaluation of the answer sheets. Generally, the board takes around 40 to 50 days to complete this task and announce the results. This year, the Assam HS Board Exam for Class 12 students will begin on 12th February with English paper which will be held in the morning slot i.e. 9 AM to 12 PM. The Assam Class 12 Board Exam will end on 14th March when the last paper of Biotechnology / History / Economics / Geography / Music will be held. Taking into account the exam dates, it seems that the AHSEC Result 2019 will be declared on time without any delays or postponements. Looking at this timeline, academic experts have suggested that the results will be declared in the last week of May 2019 or First week of June 2019. However, students must keep in mind that this is merely a speculation and that the final date of Assam 12th result will be soon announced by AHSEC through a formal notification. Until then, you are requested to keep visiting this page to get the latest information and updates about Assam HS Results 2019. Last year, the AHSEC Result was declared on 31st May for Class 12 students. The AHSEC Council declared the Assam HS Result for all the three streams i.e. Arts, Commerce and Science simultaneously. The key highlights of the Assam Higher Secondary Result 2019 are listed below. How to check Assam HS Result 2019 online? Students get very nervous and tensed before result announcement, and it is quite natural. In this emotional turmoil, students often get confused about the online checking procedure for Assam HS result. Keeping this in mind, we have listed down the key steps involved in the process of checking the Assam 12th result through our website. By following the aforementioned simple steps, you will be able to check your Assam 12th class result 2019 easily. Along with providing the AHSEC Result scorecard online, students will also have the option to download a PDF copy or take a physical printout of the scorecard for reference purposes. Students can maintain this online copy and use it to begin admission procedure in colleges of their choice. AHSEC or the Assam Higher Secondary Education Council will make the Assam HS Result 2019 available online on multiple platforms including its official website i.e. www.ahsec.nic.in. However, students must keep in mind that the Assam Class 12 Result which they check online is provisional in nature. The AHSEC will make the original mark sheets or scorecards for the Assam 12th Result 2019 to the student through their respective schools or examination centres. Class 12 students are requested to collect the original marksheet for the AHSEC Result 2019 in time. So make sure, you collect the original Assam 12th Class mark sheets issued by the AHSEC after checking your result online. Like all other educational Boards, the Assam Higher Secondary Education Council will also provide the option of rechecking and re-evaluation to the students. This option is ideal for those students who feel that they have done better in the exam and should have scored in the AHSEC Result 2019. Such students can get their answer sheets rechecked or re-evaluated through an independent examiner. Students who are confident about their performance in the Assam Board HS Results 2019 can take up this option. Details about the rechecking and re-evaluation process for Assam HS Result 2019 will be announced by the council after declaration fo the result. 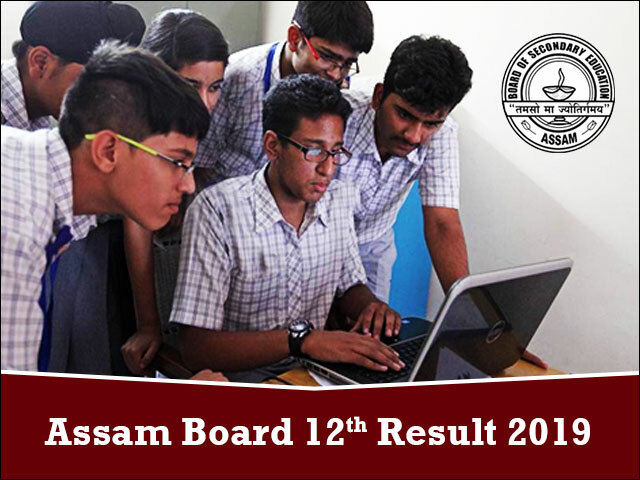 For those candidates who have failed in the Assam Board 12th Result 2019, the AHSEC will give them a second chance to improve their performance without wasting an entire year by appearing for the Supplementary Exams. The Assam 12th Compartmental Exam details will also be announced by the Board after the declaration of AHSEC Result 2019. Students can visit the official website or consult their school administrators to get more information about this. The ASHEC has released the admit card for the class 12th candidates. Click here for detailed information. The candidates must note that the board will conduct the examination in two sessions i.e. morning and afternoon.